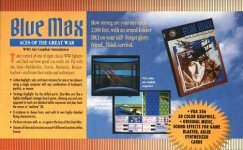 Blue Max was a World War I simulation released in 1989. 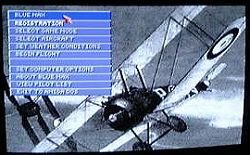 It ran in 256 colour VGA (320 x 200 pixels). MiGMan thanks Richard Leszcynskifor the scan. MiGMan thanks Eduardo Castro for the screenshots. 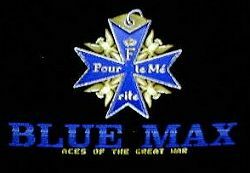 Note: Some screenshots that are somewhat blurred where taken with a photographic camera, direct from the computer monitor.